Feel all the stress disappear as you cross the beautiful Usina Bridge entering Vilano Beach and get your first glimpse of the Atlantic Ocean. It is breathtaking. You are only five minutes from your vacation and just a few steps to the beach. Come and enjoy your time on the Island, the ocean breezes and a sunrise like none other. Many activities, restaurants, shopping and sightseeing adventures are nearby. Oceanfront with open deck on oceanside . Private dock (walkover) to beach. Two ground floor units available. (Also see property #73174 - St. Augustine Beach) outside shower. Local calls to St Augustine area, Jacksonville and Orange Park. Laminate flooring and tile. Patio with picnic table and umbrella and lounge chairs. Beautiful ocean views. No smoking in units. . Pet friendly with fenced area for units A & B only. Dogs are allowed on the beach with leash. This condo is a perfect location on the beach. It's close to shopping and things to see and do. Perfect for hubby and me to relax! My husband and I had a wonderful time in Sally’s beach house, everything was perfect! Great views, well equipped and clean! We couldn’t of asked for a better experience! If you want a peaceful stay away from the Spring Break crowds, this is the place for you! Thank you so much for your hospitality! Beautiful house right on the ocean and close to things to do. Thanks again! Owner and Manager were very helpful and very quickly responded to any problems. We absolutely loved our vacation at Sally's beach house!!! Loved everything about it! 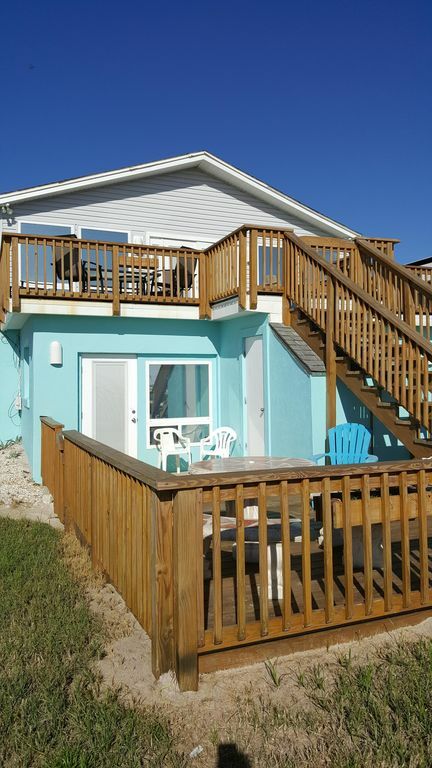 The pics do not justify this beach house! You have to just book a vacation there and see it in person. It was perfect for us, our kids and our little dog! We will definitely be back!! Our family of three had a wonderful week at this comfortable home with top notch beach access. The dock takes you directly to the water, and there are benches at the end of the dock so you can relax and enjoy the ocean. You are so close to the beautiful town of St. Augustine that it's easy to visit and site see, but far enough away to enjoy the peace and quiet. We didn't get to meet Sally during our visit, but Pat, the rental agent was very attentive and fun to talk with. We were also able to meet a lovely family from Georgia who was staying in unit B. The beach was fairly quiet, and the few people who were there were quite friendly. Thank you Sally and Pat. We hope to return soon! back riding on the beach, horse drawn carriage rides, trolleys, art galleries, museums, live theatre, antique shopping, golf, tennis, outlet mall shopping, sunset tours, not to mention visiting the Nations Oldest City! Only five minutes away from all the activities offered by Saint Augustine. Vilano Beach offers a surf shop and three restaurants within a half mile to the south, one ocean-front restaurant (great Sunday Brunch) and two intracoastal (Tolomato River) restaurants with absolutely the most beautiful sunsets you have ever seen with outdoor dining within three miles to the north. Nightly Rate: Sun-Thurs $175 / Fri.-Sat. $225 / Holiday Weekends $250 Weekly Rate: $900.00 normal (7 day) week. Holiday Week (7 Day) $1100.00 Monthly Rate: $2700 - $3300 Check in 4:00 check out 10:00 $300.00 security/damage deposit-refundable Cleaning fee $85.00/Non smoking Extra fee: Pet up to 30 lb - $100 per week or $20 per day per pet $6.00 per quest per night if over six people. Pets allowed (25 pounds and under) $20 each pet per night or $100 per week. Non-refundable deposit for each pet and no more than two pets.